There has been an explosion of research and resources on Acceptance and Commitment Therapy in recent years, and for those therapists that are new to this clinical model, the sheer amount of what’s available can be overwhelming. The second edition of Learning ACT was created to pull together all the developments that have occurred over the last decade since the first edition. The book also comes with free accessories, including some videos, which you can download here. In addition to the book, you can also download a free copy of the Learning ACT Resource Guide, which is a companion to the book that provides a regular updates list of resources to help you along your journey of learning ACT. One unique feature of the guide is that we update it every year to make sure it has the most complete list of every ACT book ever published. I created the Learning ACT Resource Guide to help sort through all the books, podcasts, videos, online learning courses, exercises, and other resources that will help you learn & master ACT. This guide is meant to give you additional ideas on how to get started and how to advance your skill and knowledge of the therapy over time. It’ll connect you with resources, with ideas on how to practice and learn, and with strategies for skill development. 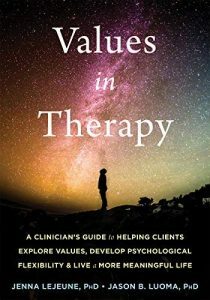 Values in Therapy: A Clinician’s Guide to Helping Clients Explore Values, Increase Psychological Flexibility, and Live a More Meaningful Life. New Harbinger: Oakland, CA. I am currently working on a book for the public on Radically Open Dialectical Behavior Therapy.